There were Godzilla films directed by men other than Honda Ishirō as early as the second one, Godzilla Raids Again, but to all purposes, he was the man who was responsible for the series as it got off its feet: him and cinematographer Koizumi Hajime, and composer Ifukbe Akira, and effects director Tsuburaya Eiji. 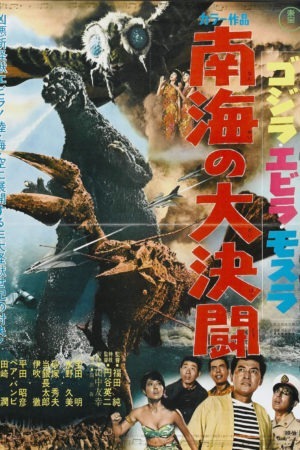 We are now come to a monumentally significant film in 1966's Ebirah, Horror of the Deep (Toho's official name for a film that's still probably better-known in America as Godzilla vs. the Sea Monster), for three of those men weren't involved in its creation at all, and Tsuburaya took a much reduced role in supervising the effects, while Arikawa Sadamasa handled most of the actual work of getting them put together. Koizumi was replaced by Yamada Kazuo (among whose earlier films we find Key of Keys, the movie redubbed by Woody Allen into What's Up, Tiger Lily? ), Ifukube by Sato Masaru, and Honda by Fukuda Jun, a man whose name looms almost as large in the fans' history of the Godzilla series as his predecessor's though for completely different reasons. Another milestone: the Godzilla vs. the Sea Monster dub was the oldest Godzilla film to show up on Mystery Science Theater 3000. You can make any damn thing of that you want to. The single major figure who returned from the earlier films to take part in Ebirah was screenwriter Sekizawa Shinichi, and that's almost as telling as who left. I don't know what really happened in the halls of Toho, so I can't really speak from anything but sheer speculation, but it seems to me, based on what sort of things Sekizawa wrote and what sort of movies that Honda and Fukuda made from his screenplays, that the writer found a much more willing partner in crime with his new colleague, who was much more willing to meet him in the place where most of his screenplays lived. The results are... colorful. Oh, I shouldn't be a grouch about it. Actually, Ebirah isn't all that bad, compared to much of what comes. From the limited viewpoint of 1966, with only seven Godzilla films in existence, this is certainly the worst; but worse it may be yet. The worst is not, so long as we can say "this is the worst". Which is Godzilla vs. Megalon. What sets Ebirah apart from the Godzilla films before it is tone, mostly; lots of setting and narrative details, but those are important mostly because of the story they permit the film to tell. Which story is a bouncy, borderline-comic adventure romp through the South Seas. There's a trio of sort of dumb heroes, a pretty native girl, and a Bond-flavored Evil Organisation with a nuclear factory full of blinking computer displays and brightly colored pipes. Sato's score is a mixture of rollicking, almost carnivalesque tunes and surf rock intruding in peculiar, frequently maddening ways (he wrote several great scores for Kurosawa films, so we can't write him off altogether, but golly, was he a weird fit for this series). The whole thing's very bubbly and inebriated on pop culture, and this gives it a distinctive kind of energy and value as a snapshot of its era. Though it's for that exact reason that I can't quite connect the dots that would make it "good" - the best things about the preceding Godzilla movies are all those qualities which are timeless and still as enjoyable now as half a century ago. While in Ebirah, the best (or at least most unique) things are those which date it the most. Anyway, the thing opens with a They Shoot Horses, Don't They?-style dance marathon, which already throws us bodily into brave new territory for a daikaiju eiga. That's not actually true: it opens with a psychic claiming that "Yata", whoever he is, must be alive, since his soul is nowhere among the dead. Which is good enough evidence to send Yata's brother Ryota (Watanabe Toru) in search of a boat to follow the missing man into the Pacific, and what should be the first prize at the local dance contest, but a sailboat? So now Ryota, and his buddies Ichino (Togin Chotaro) and Nita (Sunazuka Hideo) join in the dancing, though they crap out long before the top prize is awarded. Sulking, Ryota heads down to the marina to longingly stare at the yachts there, eventually deciding to sneak onto one for reasons best described as "because teenage boys". This particular yacht happens to have a man on it, Yoshimura (Takarada Akira, that longstanding Godzilla player, as yet another character), who doesn't seem at all happy for the boys to be there, though he's curiously unwilling to chase them out; this is because he's actually a notorious bank robber who was planning on stealing the very same vessel, and so it's not an inconvenience to him at all when Ryota surprises everyone the next morning by having taken the yacht far to the south, where Yata was last seen. Here, they run afoul of a gigantic crustacean - you'd look at it and assume that it's a lobster, but the randomly-assigned name Ebirah includes the Japanese word for "shrimp" - who wrecks the boat and strands them on an island where the evil international terrorist group Red Bamboo is attempting to build nuclear weapons. They've chosen the site because Ebirah serves as a perfect watchdog; and to help create the huge amount of Ebirah-repellent that is processed from yellow fruit found all over the island, they've kidnapped a significant portion of the population of nearby Infant Island, including a woman named Daiyo (Mizuno Kumi), who explains all of this. Infant Island, you no doubt recall, is where the moth god Mothra lives to protect her people, and the captured slaves are much invested in completing the rituals that will raise Mothra and call her to their aid. It's slow going, though, and the Japanese castaways have an even more direct notion: Godzilla, who happens to be sleeping in a subterranean cave on the island, would make a terrific distraction if he could just be woken up. Meanwhile, Ryota has managed to get himself attached to a weather balloon that lands on Infant Island, where Yata (Ibuki Toru) has been this whole time, and the reunited brothers immediately hatch a plan to save Ryota's friends and the islanders stuck in Red Bamboo's clutches, with the aid of the stubbornly comatose Mothra, still resisting the best efforts of the Twin Fairies (girl pop duo Pair Bambi, no replacement for the Ito sisters, Emi and Yumi) to rouse her. Eventually, Godzilla wakes up to beat up Ebirah and a monstrous giant condor that shows up out of the clear blue sky and is the worst-looking monster that has shown up in any Toho daikaiju eiga to this point, by which point one would be forgiven if they had forgotten that this was meant to be a Godzilla film at all. Because it's definitely not a good one of those (actually, it was meant to be a King Kong film, and Godzilla was retrofitted into it; there are lingering traces of Kong in the lizard's behavior, but not enough to pull focus). There are some charms to be mined from the Bond-influenced shenanigans of Red Bamboo, and Hirata Akihiko's turn as an eyepatch-wearing villain, but there's precious damn little fun to be had on the giant monsters smashing things front, particularly given how little we see any of the giant monsters (Mothra, despite being featured in the Japanese title, is active for around 90 seconds of screentime). There's a reason for this, and it's the most obvious one in the world: the powers that be at Toho had decided that Godzilla was starting to cost more than he was worth - the franchise had been losing air steadily since the high point of King Kong vs. Godzilla, four years earlier - and the way forward was to make cheaper monster pictures going forward. This explains the setting (no costly city models to build), and the choice of Fukuda as director, for despite his greenness in daikaiju eiga, he was a pro at making quick, cheap genre pictures for Toho, and that's what they were looking for in place of Honda's stately, methodical style. Taken it as given that Ebirah was going to be cheap no matter what, I don't know that Fukuda did such an awful job of it. It's not one of those things where the limitations turn into virtues: the kaiju drought in the first hour is dismaying, no two ways about it, and the "boys vs. international terrorists with a bank robber in tow" plotline gets very shaggy, very early on. Also, while Fukuda does a satisfactory job of making a cheapjack Bond rip-off, that's not necessarily a subgenre that finds anybody doing their best or most enjoyable work, and the long stretch of time the movie spends in that place doesn't do it any favors at all. It's more cohesive than a lot of what follows, and Ebirah is a well-built monster, if somewhat prosaic in conception and design, but the massive drop-off in quality from the last film to this one makes it awfully hard to rationalise that. It's a decent film at best, a flimsy and uninvolving film at worst, and a discouraging sign that the days of Godzilla as a serious, interesting threat were now officially dead and buried.